At CES we expected to see the release of a ton of 4K and 8K TV. In line with our expectation, we saw the release of a 146-inch modular LED TV from Samsung and a 65-inch OLED TV from LG among others. However, the one TV that caught our eye not only supports an 8K display, but also packs an AI technology which automatically upscales lower resolution pictures to 8K picture quality. The major reason why 8K TVs has not become mainstream is because there’s just not enough content catalog which can take advantage of an 8K display. Even 4K quality videos are rare in the mainstream, especially for everyday viewing. That’s why consumers are not yet ready to splurge on expensive televisions, which might not have enough compatible content. Well, Samsung wants to change the game with its 8K AI television. 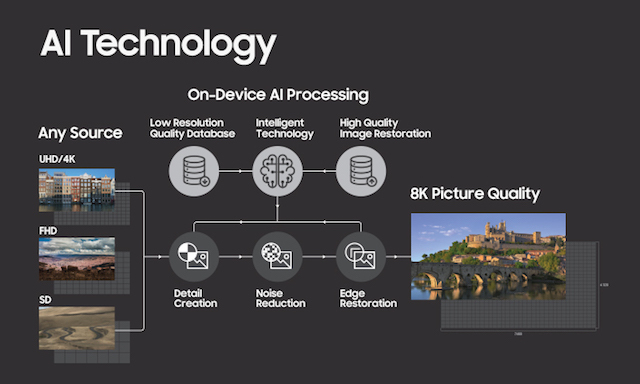 First, the AI technology that comes bundled with the 8K TV comes equipped with a database that studies and analyzes millions of images in advance to transform low-resolution content into high-resolution. 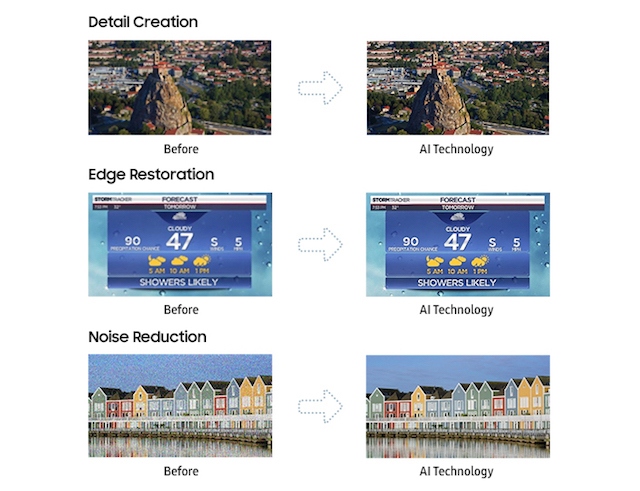 When a low-resolution content is fed into TV via any source, it automatically enables the suitable filter to convert the content into a high-quality image. The TV does that by increasing the image processing by 64 times which results in upscaling of the picture without any degradation. Lastly, the new QLED TV has the ability to categorize elements of a picture quality and enhance those qualities individually to give a richer and more contrast full picture. Not only that, the AI also helps the TV to manage the audio quality of TV depending on the content you are watching. For example, if you are watching a game, the TV will enhance the crowd cheering to give you a more immersive watching experience. According to the company, the 8K AI TV will be produced in models of sizes 65-inch and above and will be available in the second half of 2018. However, no pricing details have been revealed as of now.